As usual we had the perfect weather for golf. We have been lucky to benefit from dry conditions for a number of years. We must thank all our sponsors who helped to support the day – Pointon York SIPP Solutions, Baxters the Printers, Charles Russell, Hill Dickinson, SSP, AXA Elevate, Hettle Andrews, Jubilee, JPJshare.com, Leasemaster and Montague Capital. Our special guest this year was Roger Helmer MEP. 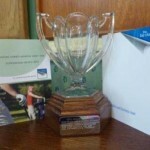 Teams of two battled in pairs to gain the premium number of points to win the treasured trophy. This year’s winners were a brother and sister duo Rachel Marvin and Alastair Higgins. 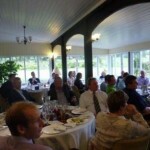 As usual the golfers enjoyed luncheon at Luffenham Heath. The splendid buffet has become a firm favourite of all attendees and is just what is needed after a round of golf. 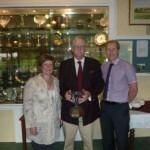 A few non-golfers joined for the prize giving and enjoyed listening to Roger Helmer’s speech on Europe.